Monday, Aug. 6, 7:30 p.m.
Monday, Aug. 6, 9 p.m.
James Jordan and the Same Stream are thrilled to be returning to the Cathedral Basilica of SS. Peter and Paul in Philadelphia for their annual concert taking place on Monday, Aug. 6 at 7:30 p.m. 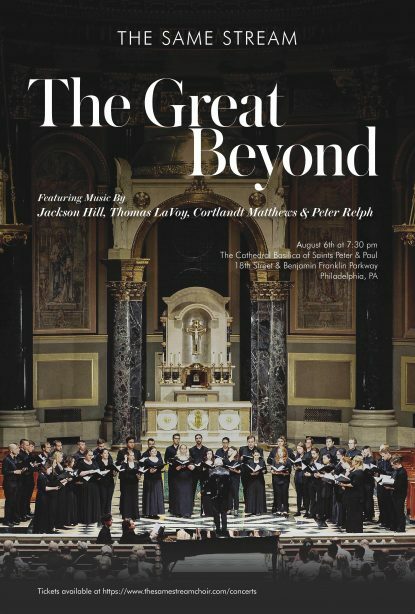 These dynamos of the American choral music scene present a program titled “The Great Beyond,” featuring music by Jackson Hill, Thomas LaVoy, Cortlandt Matthews and Peter Relph, that examines the human experience from both the sacred and secular perspectives. Tickets for this program will be available both online and at the door. For venue information please call 610-223-4191.